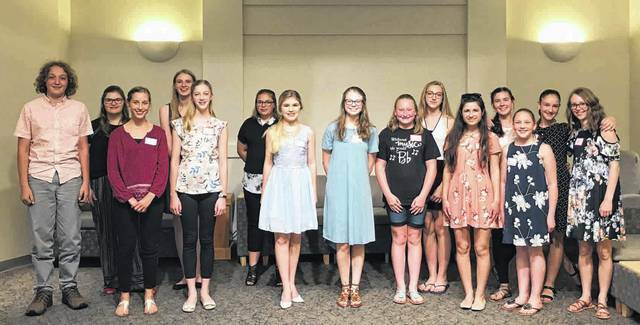 The Black Swamp Arts Council awarded 21 students as part of their 2018 Summer Arts Scholarships program. The Black Swamp Arts Council (BSAC) awarded nearly $4,000 to 21 students from northwest Ohio as part of their 2018 Summer Arts Scholarships program. Recipients were honored at a June 4 awards ceremony at Shalom Counseling and Mediation Center in Archbold. Students will attend music, theater, dance, fine arts, culinary arts camps and private instruction in seven states. Included are Ballet Magnificat (Jackson, Miss. ), Genius Olympiad (Lake Ontario, NY), Hollywood Dreamin’ (Los Angeles, Calif.), and numerous camps in Ohio and bordering states. The BSAC Summer Arts Scholarship program was created to provide financial assistance for students entering grades 7-12 to receive enrichment and return to school in the fall with greater proficiency, and become leaders in their chosen areas. Several former scholarship recipients are currently teachers and staff members in area arts education programs. Since their summer arts program began in 2002, the Black Swamp Arts Council has awarded scholarships to approximately 270 students. Leah Pitman, home educated, Ballet Magnificat; Brianna Bell, Hilltop High School, Genius Olympiad; Allison Parker, Bryan Middle School, BGSU Orchestra Camp; Katie Davis, Bryan High School, Baldwin Wallace Music Theater Camp; Madelyn Krueger, Pettisville High School, Sullivan University’s Culinary Summer Camp; Dana Voll, Archbold High School; ONU Summer Music Camp; Allison Kurfis, home educated, Messiah College Dance Intensive; Arlie Lambright, Archbold High School, Detroit Street Photography; Aubrie Calvin, Hilltop High School, Summer Voice Lessons; Cody Williams, Pettisville High School, Private voice lessons with Clara Beck; Jane McCartney, home educated, Black Swamp Fine Arts School Advanced Dance Intensive; Cate McCartney, home educated, Black Swamp Fine Arts School Advanced Dance Intensive; Rose Montion, home educated, Black Swamp Fine Arts School Advanced Dance Intensive; Reece Miller, Defiance High School, Hollywood Dreamin’; Marijanna Brunn, Wauseon High School, Blue Lake Fine Arts Camp; Magdalena Duden, Wauseon High School, digital photography at Toledo Museum of Art; Jessica Harmon, Evergreen High School, Lambec Music Camp; Benjamin Zimmerman, home educated, Black Swamp Fine Arts School Chamber Music Camp; Cailynn Zimmerman, home educated, Black Swamp Fine Arts Chamber Music, Advanced Dance and Ballet; Luke Reynolds, Defiance High School, Blue Lake Fine Arts Camp; Riley Mutscheller, Toledo School for Arts, Grand Rapids Ballet Summer Intensive.